A standing room only crowd filled the auditorium at South Burlington High School Monday night to weigh in on a proposal to bring new F-35A fighter jets to Burlington International Airport. The Vermont Air Guard has been identified as a potential site for deployment of the jets as early as 2015. For nearly two-and-a-half hours, a long succession of people filed to the podium to express their opinions. By the time the presiding officer ended the meeting, the crowd had thinned considerably, but there were still people waiting to speak. The hearing was held to solicit comments on an environmental impact statement about the effect F-35 jets would have if they fly out of the Air Guard facility at Burlington International Airport. But many proponents of the plan lingered instead on the economic benefits of having a strong National Guard in the Burlington area. Supporters outnumbered opposing speakers. They were bolstered by elected officials who endorsed the proposal and a strong show of support from the business community. "It is important to the economic vitality of Burlington that we retain these more than 1,000 jobs that are represented from this air national guard program," said Kelly Devine, executive director of the Burlington Business Association. "Fifty million dollars in payroll is a lot of money coming into Chittenden County every year. In addition, the services that the guard provides and the revenue that comes into the Burlington International Airport are vital for keeping that facility strong and active." The computer modeling used for measuring the environmental impact of the F-35 envisions less pollution but higher noise levels over a larger area than the current F-16 jets. Those who questioned bringing the F-35 to Burlington argue the increased noise has its own economic impact on property values and quality of life. Mark Abrams of South Burlington says he’s proud to have the guard in his community, but he’s concerned that there’s already too much noise from the F-16 jets. In his view, the F-35s are inappropriate so close to Burlington. "Walking on my street at certain times I literally have to close my ears. I’m trying to maintain my hearing as I get older,’ Abrams told the hearing. "You’re talking about the most populated areas of the state: The most residents, the most students, the most hospital patients." 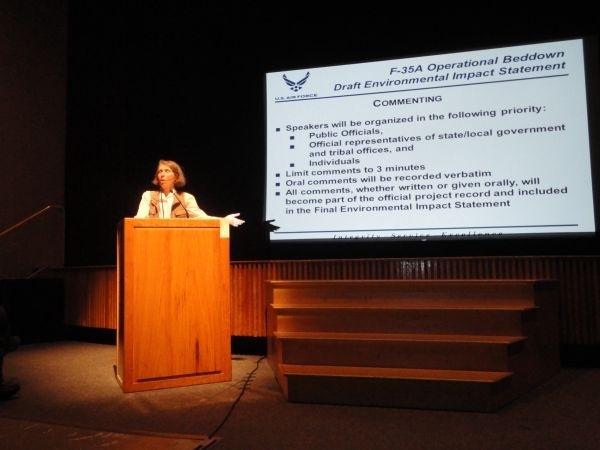 The Air Force is accepting public comments on the environmental impact statement until June 1. Burlington is one of two preferred bases for the F-35. The other is in Utah. The Lake Champlain Regional Chamber of Commerce has released results of its petition drive in support of basing the F-35 jet fighters at the Vermont Air Guard Base in South Burlington, asking South Burlington’s City Council to reverse its vote in opposition.